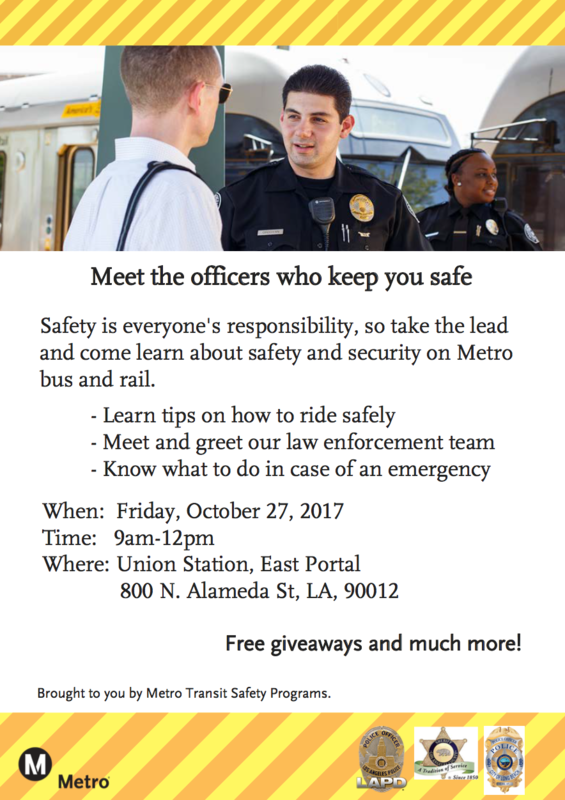 Metro will be hosting a law enforcement meet and greet on Friday, Oct. 27 at the Union Station East Portal from 9 a.m. to noon. Stop by and get to know the police officers who patrol our system; there will be tables for Long Beach Police Department, Los Angeles Police Department, Los Angeles County Sheriff’s Department and Metro Transit Security. Metro Community Education will also be participating in the event by providing safety information, user guides and other fun prizes. Take the Dodger Stadium Express to Games 6 and 7 of the World Series! That is a very poor time to hold this event. Most people who commute to work on Metro will probably be at work in the middle of a weekday morning. They wiil not be able to attend this event. That was my first thought too. Holding it right when everyone is clocking in. Well played, law enforcement.